I hope you enjoyed a wonderful holiday weekend with family and friends! If you’ve got the Monday blahs, I’ve got a nice surprise for you. Today we begin the second round of the Holiday Entertaining Blog Tour, focusing on inspiration for the Christmas holidays. I’ve joined with 30 talented bloggers to bring you this tour and will be hosting it on the blog all week. You can follow along in order or just click on the links at the bottom of the post. 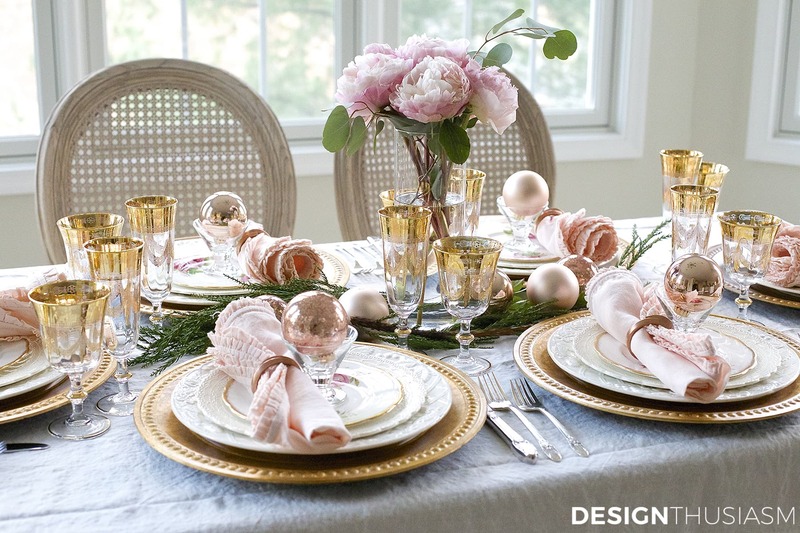 And since I’m the first stop on the tour, please join me at my elegant Christmas table setting in pink and gold. Enjoy the tour! 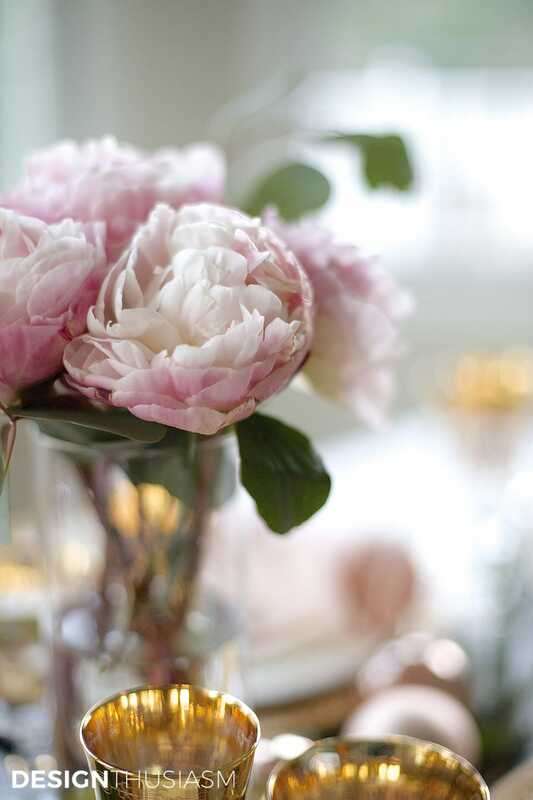 I’ve been thrilled the last few weeks to find peonies at the florists, and all the better, in my favorite soft pink color. I knew they needed to be featured prominently on my holiday table, as I’d already decided this was the palette I wanted to work with. 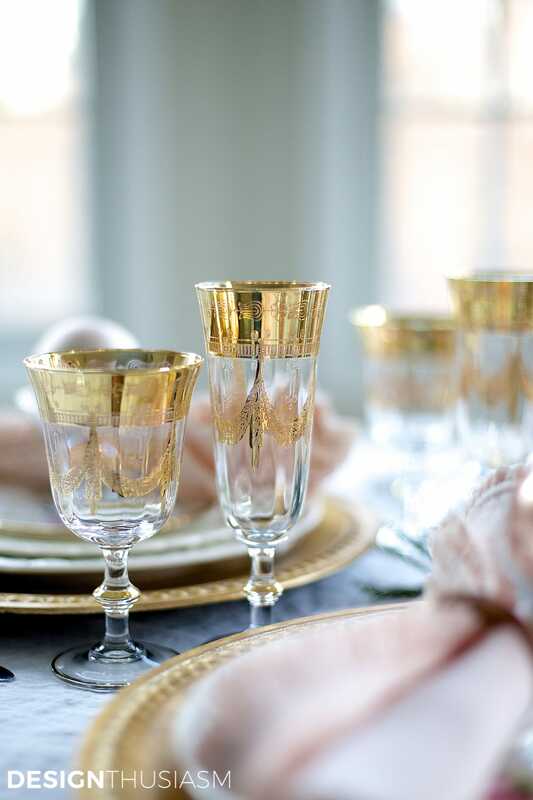 I’ve also been crushing on this new gilded stemware, so that marriage right there drove the direction of my table. 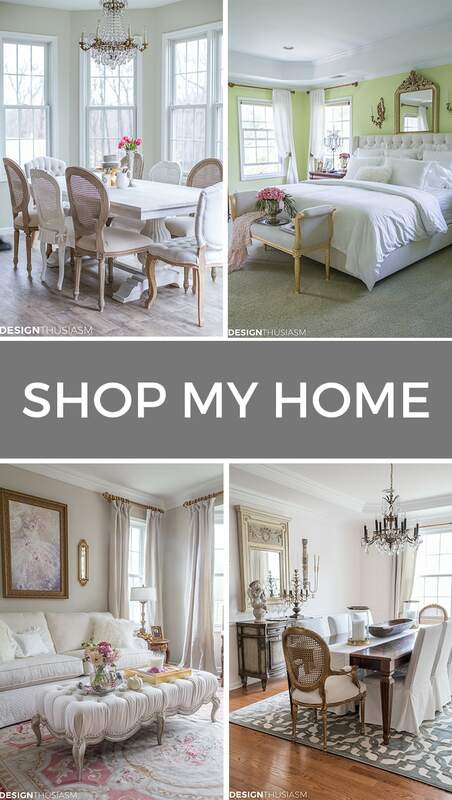 There’s no question, I’m a mix-and-matcher, and I approach my tablescapes the way I approach my rooms. I select a color feeling and a pattern or two and the rest just needs to blend comfortably. Here I began with golden chargers, topped with two different cream textured plates. 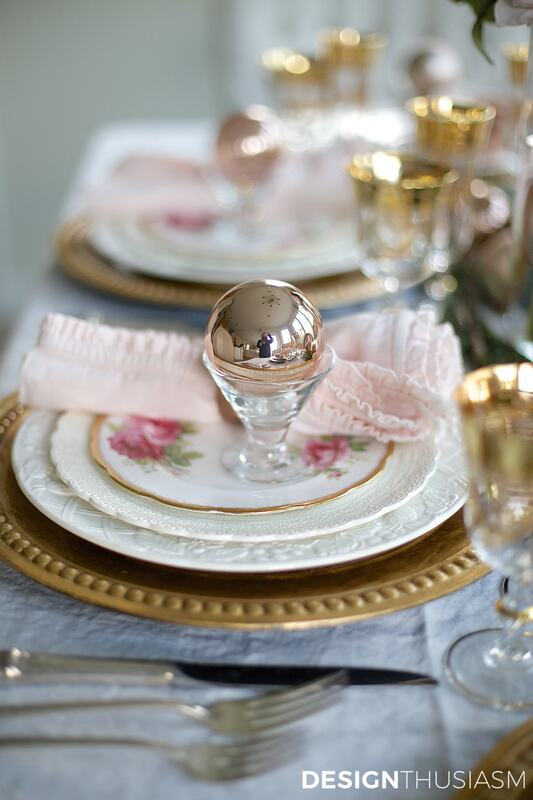 The crowning touch is a petite plate in a vintage china floral with gilded edging. (See source list at the bottom of the post). I’m over the moon in love with these new flutes and goblets. They’re actually rather small yet they make a bold statement on the table. 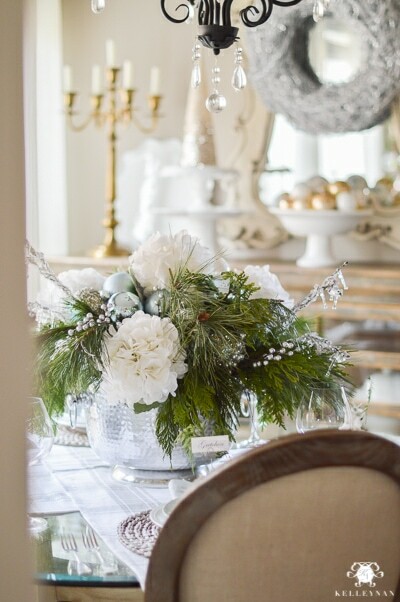 Bolstering the floral centerpiece is the placement of greenery along the center of the table, peppered with rose gold ornaments in varied finishes. They add just the right note of holiday glimmer and are the perfect bridge between pink and gold. Another new find that I’m crazy about is this wonderful ruffled linen tablecloth with a relaxed shabby chic vibe. It keeps all the gilding from getting too serious and dusts the floor with just the right drape. Tiny glass dessert cups serve up holiday ornaments at each place setting. The warm rosy glow is exactly the look I was going for at this elegant Christmas table. 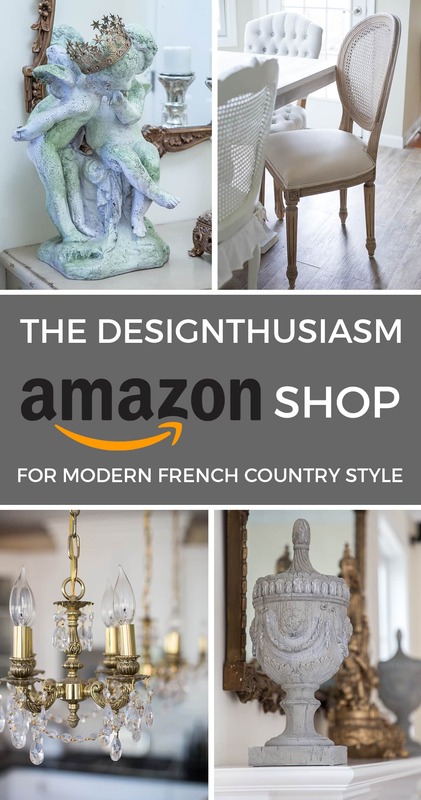 It’s welcoming and festive and provides the precise feeling you want for your guests. Thanks for visiting with me for my holiday planning! Please take some time to enjoy the other posts by clicking on the links below, and don’t forget to come back each day this week for more Holiday Entertaining Blog Tours! If you’d like to follow the tour in order, the next stop is Decor Gold Designs and wait ’til you see Jennifer’s stunning table! Love the pink and gold, its so rich, elegant and feminine without being overly so. I love all the touches and the gold adds just the right amount of glam. Wonderful job Lory, hoping you have a magical holiday season, thanks for putting this fun series together! Thank you so much, Tina! And my pleasure – so glad you joined us… 🙂 You’ll be seeing my blue and whites coming in a post soon, too! Absolutely gorgeous. The pink and gold is stunning. You’ve collected some of my favorite colors…just gorgeous. Thanks for the tour Lory! Thanks so much, Janet!! Yes, I finally found the pink ornaments… 😉 Next step… the tree! Beautiful as usual..I know Arte Italica when I see it. I worked in a store that carried it. What’s not to like ????? Needless to say, I have a few pieces. Oh Lory, this is absolutely beautiful! 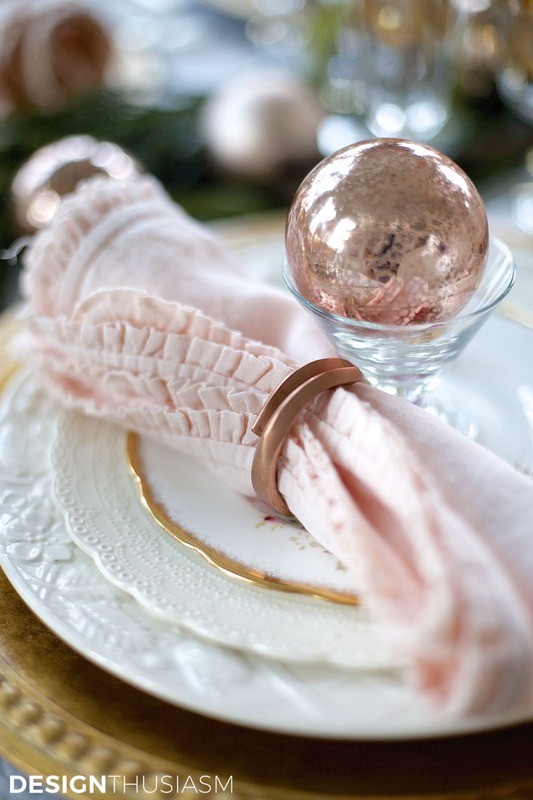 The blush and pink colors are just perfect with your new ruffled tablecloth. You’ve created the most beautiful table! Love it! Wow this is stunning Lory!! 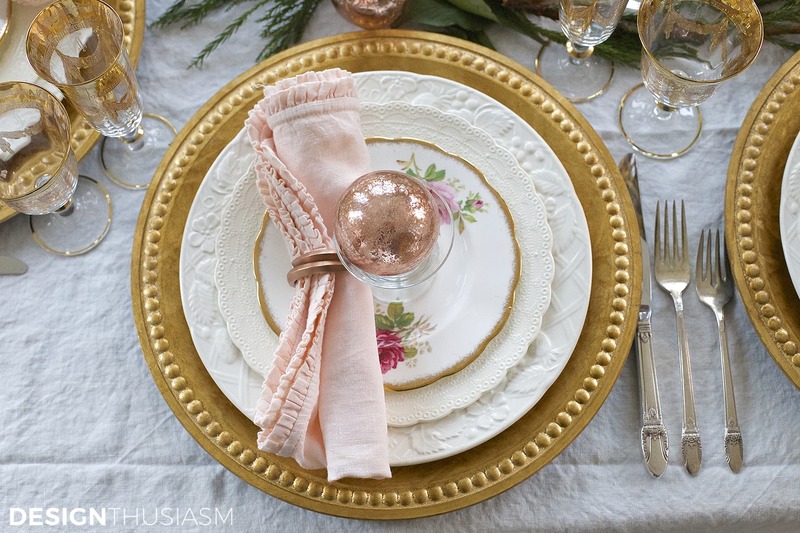 I am a big fan of pink and gold…my table will have my spin on this combo tomorrow! 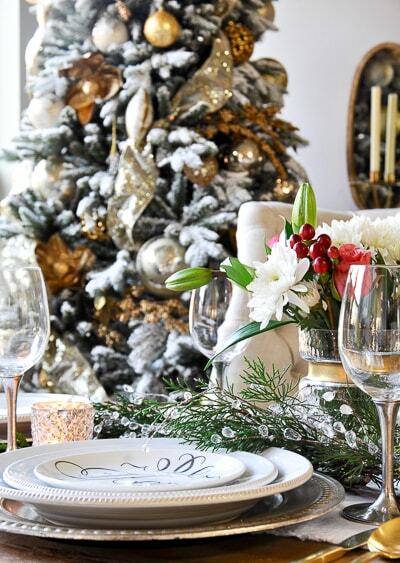 It makes for a pretty yet festive table, which is soooo romantic! Thanks Amy, and I can’t wait to see it!! Already loved the teaser photo so I’m sure I won’t be disappointed! Oh my ! Be still my heart ! I have always preferred golds,soft coppers and rose golds. This is so gorgeous and so nice to see that gold is becoming stylish once again . 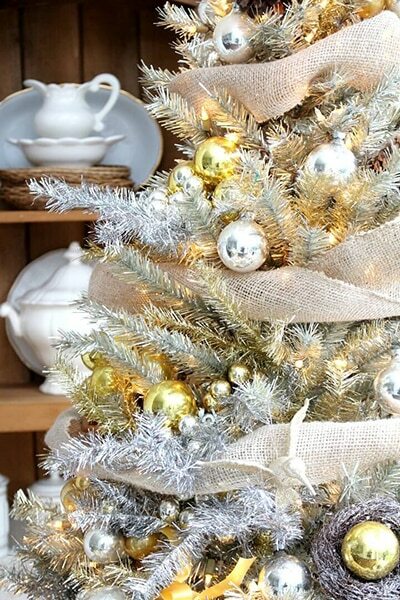 Silver is festive and elegant , but gold is so warm and inviting and has always been my favorite . 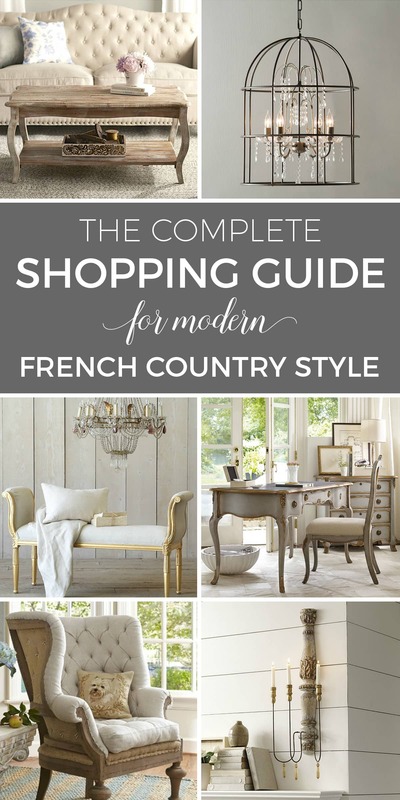 Your blog has captured my attention and I am so happy to have found you ! Thank you for bringing beauty into my home and the homes of your dedicated following . Thank you for organizing this stunning tour & including me. WOW, WOW, WOW! SIGH! What a stunning table, Lory! 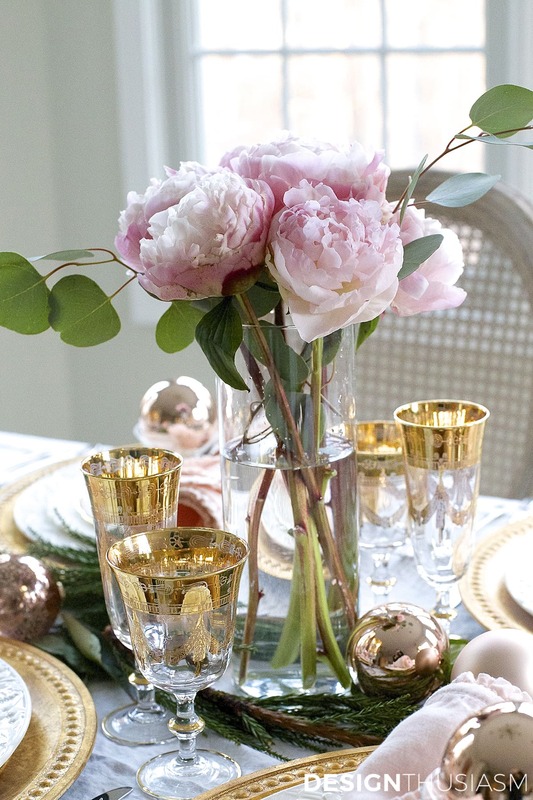 Who knew that peonies would work so fabulously for Christmas. You are the master at soft, gorgeous tables! Thanks so much for including me in your Holiday Entertaining Blog tour! This has been so so much fun! Gorgeous, Lory! I love the color combo and your tablecloth is perfection! Lory this is gorgeous! 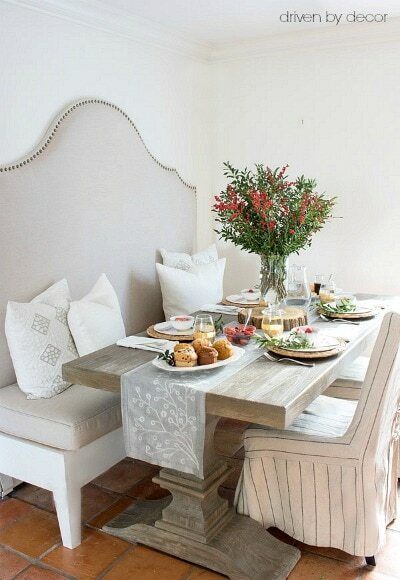 I have serious envy of your ruffled tablecloth – it’s just perfect for your table. Such a great kick off to the holiday entertaining tour!! Oh, Lory, such a lovely table! The ornaments in the glasses are such a perfect addition! 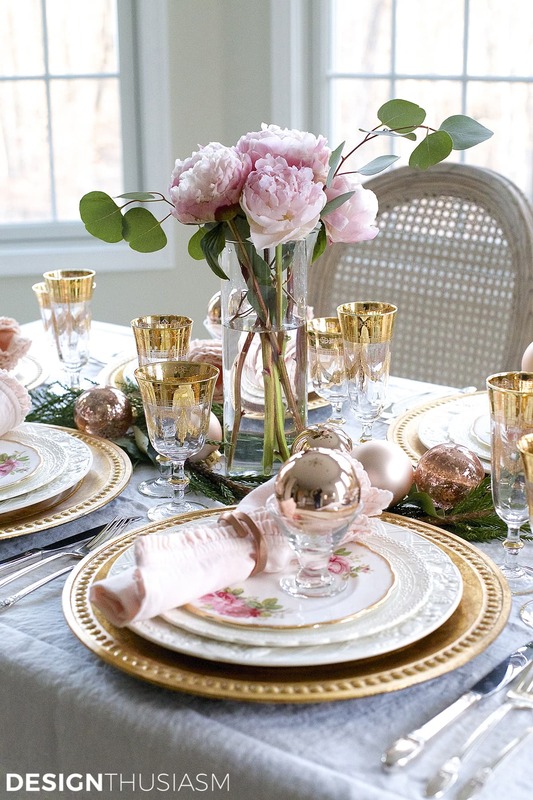 A most elegant and romantic Holiday table. 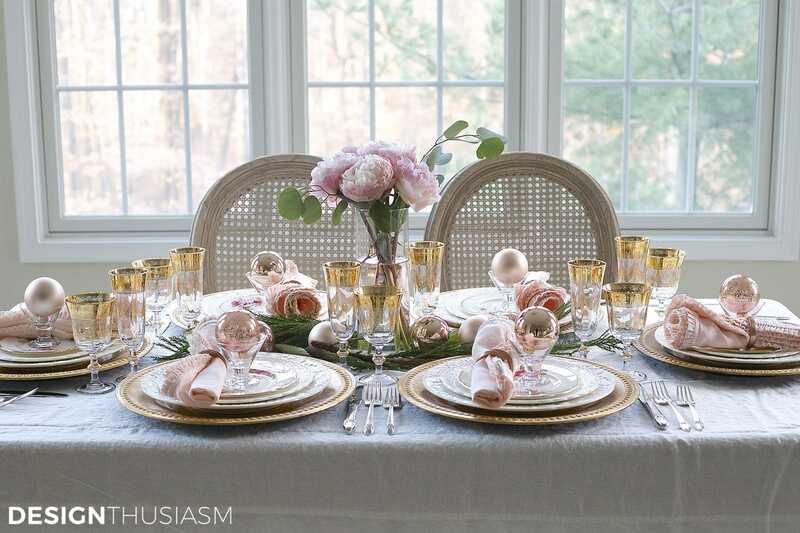 Love the ruffled tablecloth and those gold goblets are exquisite! Lory this is seriously stunning! 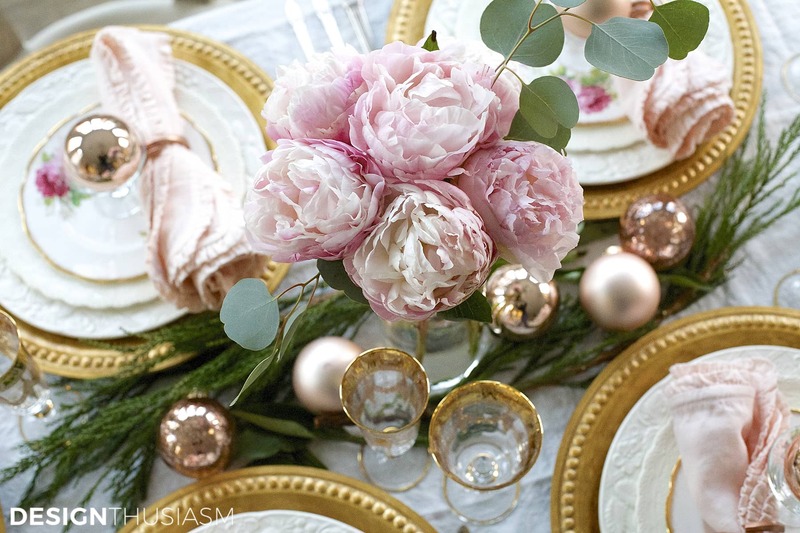 The gold rimmed glasses and the soft pink peonies are such an elegant combination…! I am always in awe of your beautiful tables! So gorgeous, Lory!! I love these pinks and golds together. Thanks for having me on your group tour! Apologize for being behind Lory. I so enjoy your table settings, you are t he MASTER. The blush tones and the gold are just stunning!!! So gorgeous, Lory. I love the pink and gold together. Another amazing table done in Lory style. This pink is so beautiful! You are one talented lady! Merry Christmas! This is just so pretty. I have many similar items but did not do this…now I will but for spring setting. 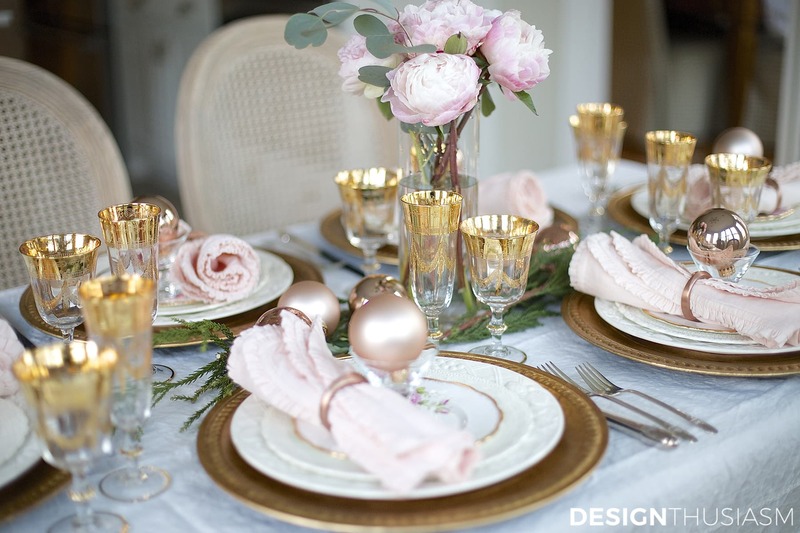 Years ago I bought gold rimmed Vietre goblets and champagne flutes and I think a flower floating in a dessert cup will be nice…I have cream dishes, floral salad, and gold chargers and pink flowered linen napkins…thanks so much for this idea! Jillian, it sounds to me like you need a blog if you don’t already have one! 😉 How wonderful gold rimmed Vietre goblets sound for most any table!! You seem to have a wonderful collection. So beautiful and elegant! Perfect for New Year’s! What an stunning tablescape! I am in love with your gold rimmed Vietre stemware, it’s so regal and elegant. Your stock of plates is lovely too, specially the Spode. Pinning.